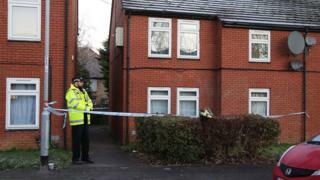 A 30-year-old man has been arrested on suspicion of murder following the death of a two-year-old child in Northampton. Police and paramedics were called to Arthur Street at lunchtime following reports that a child was unresponsive. The child died after being taken to Northampton General Hospital. The suspect is in custody and house-to-house inquiries will be taking place in Arthur Street while officers establish the circumstances surrounding the child's death, police said.